Having achieved youthful success as a portrait painter, Rembrandt’s later years were marked by personal tragedy and financial hardships. Yet his etchings and paintings were popular throughout his lifetime, his reputation as an artist remained high, and for twenty years he taught many important Dutch painters. Rembrandt’s greatest creative triumphs are exemplified most notably in his portraits of his contemporaries, self-portraits and illustrations of scenes from the Bible. His self-portraits form a unique and intimate biography, in which the artist surveyed himself without vanity and with the utmost sincerity. Rembrandt Harmenszoon van Rijn was born on 15 July 1606 in Leiden, in the Dutch Republic, now the Netherlands. His parents were Harmen Gerritszoon van Rijn and Neeltgen Willemsdochter van Zuytbrouck, and he was their ninth child. His father worked as a miller and his family was a well-to-do one. He attended Latin school and is believed to have enrolled at the University of Leiden for his higher studies. He was interested in the arts from an early age and was apprenticed to a Leiden history painter, Jacob van Swanenburgh, who was renowned for his ability to paint fire and illumination. The influence of this early training period can be observed in many of Rembrandt’s future paintings. After training under van Swanenburgh for three years, he apprenticed for six months with the painter Pieter Lastman in Amsterdam. Lastman was a famous history painter and under his tutelage Rembrandt learned the skill of placing figures from biblical, historical and allegorical scenes in complex settings. Some sources also suggest that he received training from the painter Joris van Schooten too. He developed his own unique style of painting light and illumination that made him very famous. His paintings ‘Peter and Paul Disputing’ (1628) and ‘Judas Repentant and Returning the Pieces of Silver’ (1629) are some of the paintings which display his ingenuity in handling the concept of light. Rembrandt achieved considerable success within a few years of becoming a professional painter and this attracted numerous aspiring painters to his studio who were eager to be trained by the great master. In the late 1620s he began accepting students and Gerrit Dou was one of his early pupils. Rembrandt became acquainted with the statesman Constantijn Huygens which proved to be quite profitable for the artist. Huygens greatly appreciated Rembrandt’s paintings and starting from 1629, helped the artist in procuring important commissions from the court of The Hague. 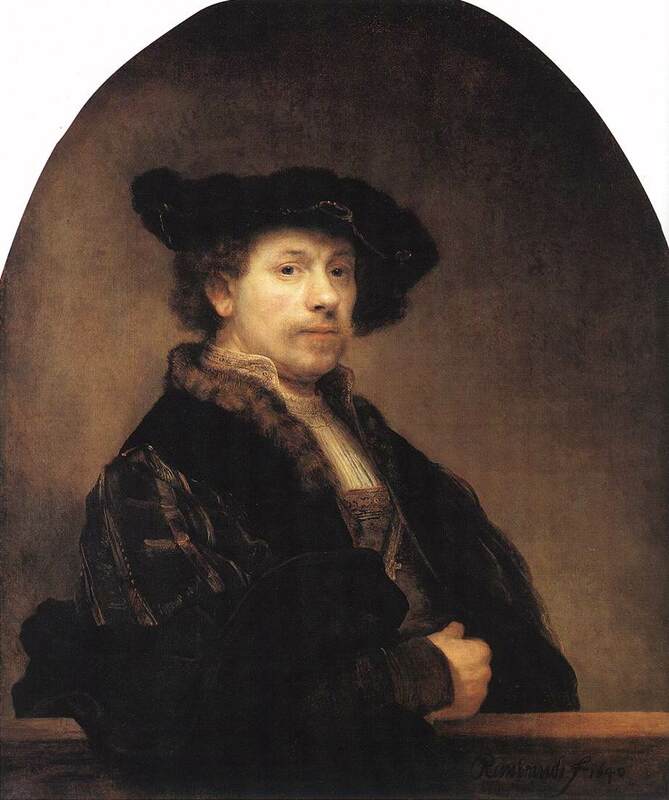 Buoyed by his success, Rembrandt moved to Amsterdam in 1631 in order to expand his business. He initially stayed with an art dealer, Hendrick van Uylenburgh, who had a workshop that created portraits and restored paintings. During this time Rembrandt began working as a portraitist for the first time and was praised for the realism in his portraits. During the 1630s he also began painting dramatic biblical and mythological scenes in large format. Some of his works from this period include ‘The Blinding of Samson’ (1636), ‘Belshazzar’s Feast’ (c. 1635), and ‘Danaë’ (1636). His style underwent a significant change in the 1640s. His paintings now became less dramatic and more sober in tone. The 1640s also marked a tragic period in his personal life which might have been the reason behind his changed style of painting. During this difficult period he painted several biblical scenes from the New Testament than the Old Testament. The 1650s saw more changes in his style of art. He took to painting with more vibrant hues and bolder brushstrokes. His new style departed considerably from his older delicate style and became coarser. The biblical themes in his later paintings shifted to intimate portrait-like figures from the dramatic group scenes he once used to specialize in. 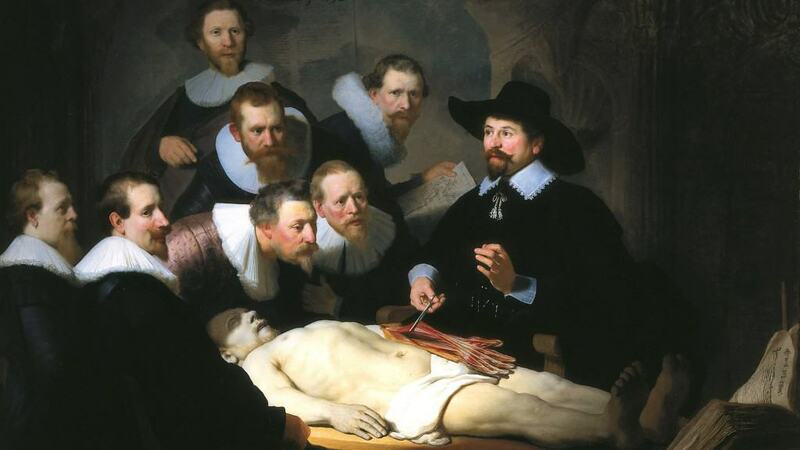 His painting ‘The Anatomy Lesson of Dr. Nicolaes Tulp’ (1632) is a much-discussed one among the medical fraternity. In the oil painting he depicted Dr. Nicolaes Tulp, a famous Dutch surgeon, explaining the musculature of the arm to medical professionals. His 1642 painting, ‘The Night Watch’ is one of his more ambitious works. Considered to be a world renowned example of Baroque art, the painting is famous for the effective use of light and shadow, and the perception of motion in what would have traditionally been a static military portrait. Rembrandt married his friend Hendrick’s cousin, Saskia van Uylenburgh, in 1634. His wife was the daughter of a lawyer. His family life was marked with several great personal tragedies. Even though his wife gave birth to four children, only one of them survived infancy. His wife too died young, leaving him devastated. He had a short term relationship with his son’s nurse Geertje Dircx following the death of his wife. Later on he became romantically involved with a much younger woman, Hendrickje Stoffels, who had initially been his maid. This union produced a daughter. Even though the couple did not marry formally, the two were considered legally wed under common law. His last years were very tragic ones as both his common-law wife and his son predeceased the great artist. He died on 4 October 1669 in Amsterdam, and was buried in an unknown grave in the Westerkerk. He was a poor man at the time of his death. A prolific painter, draftsman, and etcher, Rembrandt is usually regarded as the greatest artist of Holland’s “Golden Age.” He worked first in his native Leiden and, from 1632 onward, in Amsterdam, where he had studied briefly (ca. 1624) with the influential history painter Pieter Lastman. Rembrandt never went abroad, but he voraciously surveyed the work of Northern artists who had lived in Italy, like Lastman, the Utrecht painter Gerrit van Honthorst (Rembrandt’s main link to Caravaggio), Anthony van Dyck, and—mostly through prints—Adam Elsheimer and Peter Paul Rubens. In the Leiden period, Rembrandt also responded strongly to earlier Netherlandish artists such as Lucas van Leyden (1489/94–1533). However, a crucial aspect of Rembrandt’s development was his intense study of people, objects, and their surroundings “from life,” as is obvious in paintings like his early self-portraits and the Saint Paul in Prison of 1627 (Stuttgart, Staatsgalerie). Even by Dutch standards, Rembrandt’s preoccupation with direct observation was exceptional and continued throughout his career. Despite the constant evolution of his style, Rembrandt’s compelling descriptions of light, space, atmosphere, modeling, texture, and human situations may be traced back even from his late works (such as The Jewish Bride, Amsterdam, Rijksmuseum) to the foundations of his Leiden years. It was also this program, in good part, that made Rembrandt a great teacher. His many pupils included Gerrit Dou, Govert Flinck, Ferdinand Bol, Nicolaes Maes, and Carel Fabritius. In Amsterdam, Rembrandt became a prominent portraitist, attracting attention with dramatic compositions like The Anatomy Lesson of Dr. Tulp (1632; The Hague, Mauritshuis). 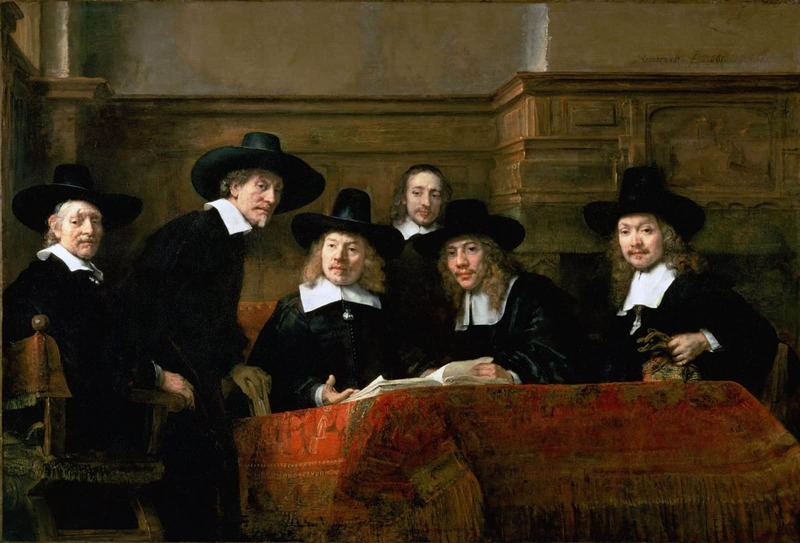 In securing commissions, the artist was assisted by the Mennonite art dealer Hendrick Uylenburgh, whose cousin Saskia married Rembrandt in 1634. 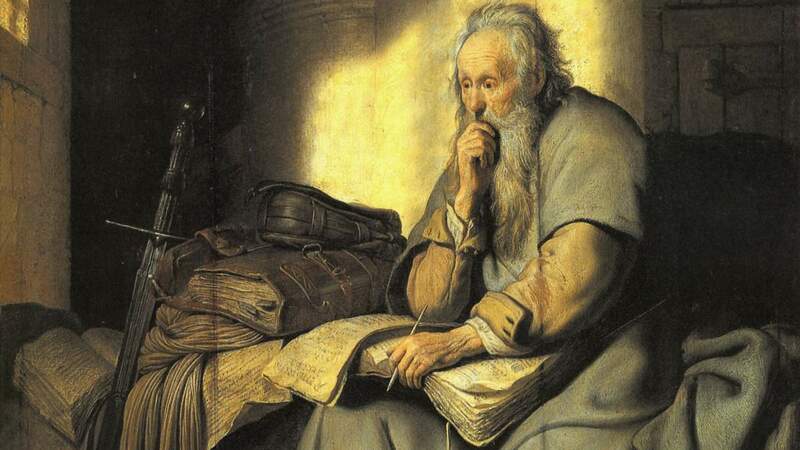 The Mennonites advocated personal interpretation of scripture, which probably influenced Rembrandt’s subjective and often moving treatment of biblical subjects. The artist became highly successful in the 1630s, when he had several pupils and assistants, started his own art collection, and lived the life of a cultivated gentleman, especially in the impressive residence he purchased in 1639 (now the “Rembrandt House” museum). Rembrandt exudes confidence and urbanity in his Self-Portrait of 1640 (London, National Gallery), which was modeled upon courtly portraits by Raphael and Titian. These artists probably also inspired his Amsterdam signature, “Rembrandt” (dropping “van Rijn”). In the 1640s, Rembrandt’s frequently theatrical style of the previous decade gave way to a more contemplative manner, a mature example of which is Aristotle with a Bust of Homer (1653; 61.198). The change reflects period taste but also personal circumstances, such as Saskia’s death in 1642, financial problems, and the artist’s controversial relationship with his son’s nurse, Geertje Dircks, and then with his maidservant (and close companion) Hendrickje Stoffels. The great group portrait known as The Night Watch, dated 1642 (Amsterdam, Rijksmuseum), could be said to mark the end of Rembrandt’s most successful years, but the legend that customer dissatisfaction ruined his reputation is refuted by later commissions from such prominent patrons as Jan Six and the Amsterdam city government. The extraordinary volume of Rembrandt’s production even after he declared insolvency in 1656 is punctuated by dozens of masterworks, like The Syndics of the Amsterdam Drapers’ Guild (1662; Amsterdam, Rijksmuseum). 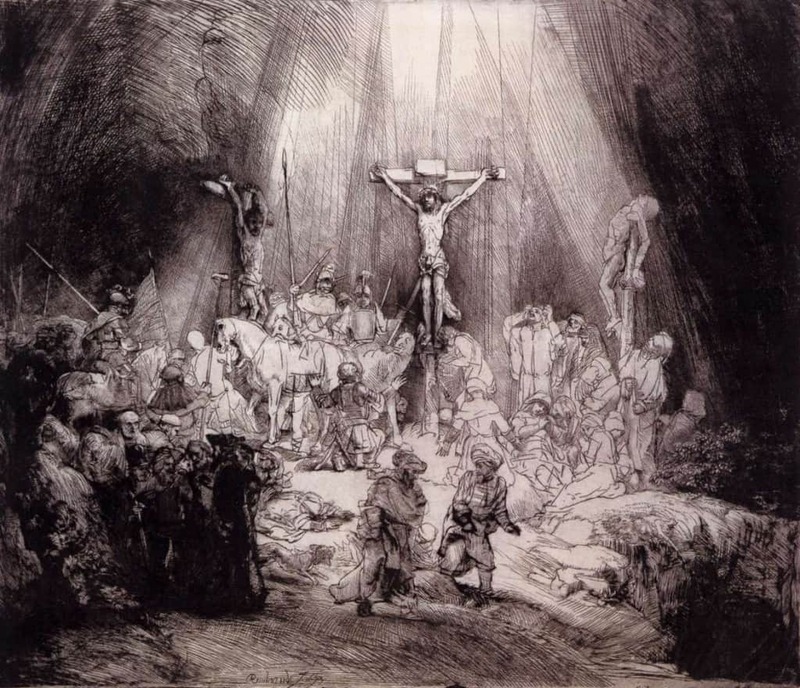 The powers of invention and perception that made Rembrandt a famous painter in his own time also made him a virtuoso draftsman (as is evident in works as different as The Last Supper after Leonardo da Vinci and Cottage among Trees (29.100.939) and the most innovative printmaker of the seventeenth century. In about 350 etchings, he extended the medium’s capacity to suggest various kinds of illumination and painterly effects. Some examples, like The Three Crosses of 1653, were radically revised in design and expression between different states. Rembrandt inspired numerous seventeenth-century Dutch and German painters, as well as eighteenth-century artists throughout Europe (for example, Fragonard and Tiepolo) and a broad range of nineteenth-century realists. Many imitations were made in later periods, but the great majority of Rembrandtesque paintings that are not by the master date from his lifetime and suggest that his approach appealed to a fairly large audience, especially in Amsterdam. Rembrandt was his first name not his surname. His full name was Rembrandt Harmenszoon van Rijn. Until 1633, he spelt his name as ‘Rembrant’. In that year, however, he added the extra ‘d’. Rembrandt’s favourite meal was bread and cheese or pickled herring. He is known to have produced about 90 self-portraits, including paintings, etchings and drawings. According to a recent theory, Rembrandt may have suffered from ‘stereo blindness’, making him see everything flat – perhaps an advantage for a painter. 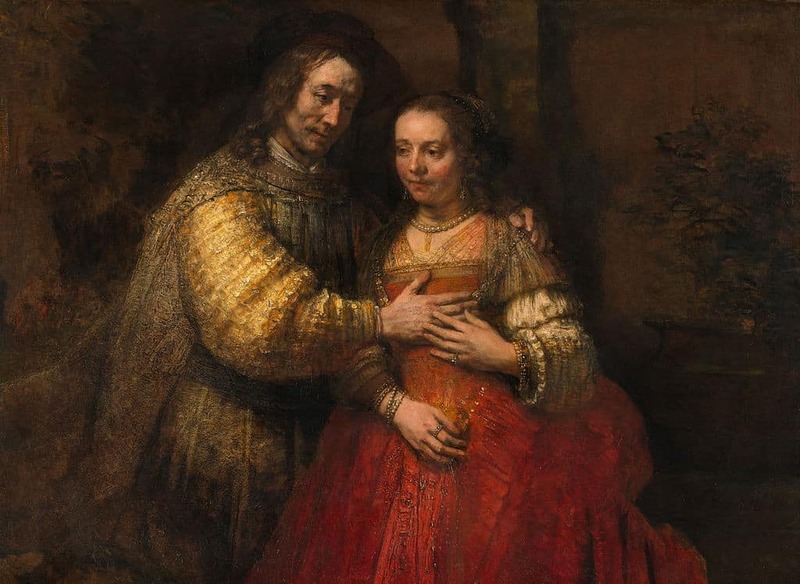 Rembrandt’s lover, Hendrickje Stoffels, who bore him a daughter, was summoned by the Dutch Reformed Church to answer the charge that she had “committed the acts of a whore with Rembrandt the painter”. He was declared bankrupt in 1656, when he even had to sell his wife’s grave. He died penniless in 1669. His son Titus had died a year before him. Rembrandt’s paintings rarely come up for auction, but his Portrait Of A Lady, Aged 62, sold for £19.8million in 2000, still a record for a Rembrandt. The life work of Rembrandt comprises 317 known paintings, 285 etchings and more than 100 drawings. Life etches itself onto our faces as we grow older, showing our violence, excesses or kindnesses. I envy the poet. He is encouraged toward drunkenness and wallows with nubile wenches while the painter must endure wretchedness and pain for his art. But his faith is a faith that to him is real, and it is a faith, in my judgement, that sustained him through the hard times in his life. A painting is complete when it has the shadows of a god. For in these two paintings the greatest and most natural movement has been expressed, which is also the main reason why they have taken so long to execute. A painting is not made to be sniffed.